Chamber works by Fauré, the influential composer who bridged the Romantic and Modern era in French music, are performed by a magnificent line-up of French and French-trained musicians. Quintessentially Gallic in its amalgam of classical rigour, inventive harmonic language and subtle, but arresting sensuality, Fauré's chamber music is here performed by nine leading French-born musicians - violinist Renaud Capuçon, violist Gérard Caussé, cellists Gautier Capuçon and Raphaël Merlin, pianist Michel D'Alberto, string quartet Quatuor Ebène - and an honorary Frenchman, US-born, Paris-trained pianist Nicholas Angelich. The four CDs comprise works for two, three, four and five instruments and span the composer's career from early works, influenced by his teacher Saint-Saëns, to the more rarefied compositions of his later years.The Capuçon brothers and Angelich - brought together by none other than Martha Argerich - are firmly established as a performing trio. Their recordings of Brahms chamber music for Virgin Classics prompted Gramophone to say that: "Nicholas Angelich and the two Capuçons play in a way that's sure to kindle anyone's enthusiasm for Brahms. Warm, beautifully balanced tone stresses the composer's romantic side, as does the expansive phrasing. There's a feeling of spontaneity, too, as though each player is discovering new aspects to the music while recording it ... the way they are able to strike a balance between Brahms's energetic flow of ideas, his strongly delineated structures and his lyric intensity is most satisfying," while International Record Review felt that "the performances here are both beautiful and individual, with passionate, rich-toned playing and infectious energy." When they played Brahms' C minor Piano Quartet with Gérard Caussé at Wigmore Hall in London, the Daily Telegraph (UK) admired the way "they beautifully conveyed the sense of some immense unspoken tragedy lurking behind the music," adding "but it was the consoling beauty of the slow movement that really told." 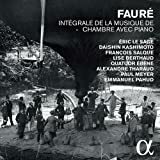 Fauré's String Quartet, composed at the end of his life, featured on the Quatuor Ebène's first Virgin Classics CD with works by Debussy and Ravel (who studied with Fauré). It became Gramophone's 2009 Record of the Year, also winning Germany's Echo Klassik Award 2009, Belgium's Prix Caecilia 2009, and, in 2010, France's Victoire de la Musique. Commenting on the Ebène's performance of the Fauré, the Independent (UK) commented that "they brilliantly negotiate the contrast between the melancholy cast of the first two movements and the more contented, even animated tone of the final movement, by allowing the lingering impressions of the second movement's see-sawing undulations to haunt the rest of the piece," while their approach to Debussy - who was born after Fauré, but predeceased him, and whose aesthetic is related to the older composer's - was summed up thus by Die Presse in Austria: "The Quatuor Ebène ensures that scrupulously conceived musical structures are also sensuous in quality, and the musicians are sensitive to the play of tensions in directional chordal shadings - that beauty in dissonance, so to speak, which can so captivate the listener."